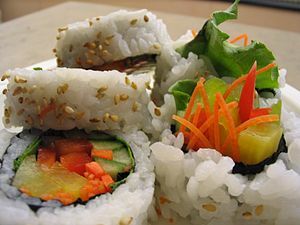 Not too long ago, it used to be that the mention of sushi had people cringing as images of raw fish entered one’s mind. The reaction was mostly because it just hadn’t caught on yet. It has now and I find it a gold mine of culinary delights. Today, sushi is everywhere. Supermarkets and cafeterias regularly have sushi chefs come in and make fresh sushi and stock the necessary ingredients and equipment to make at home. It’s always a hit. Japanese/Sushi restaurants have sprung up everywhere, almost as popular as pizza. People who used to cringe at the thought, now can’t wait until their next fix. Why is Sushi a culinary gold mine? Well it can be made to meet everyone’s tastes and dietary needs. You might be wondering how that is true. The most common forms of sushi found in most restaurants, stores, cafeterias, etc. contain seafood (cooked or raw). However, sushi does not mean raw fish or even a roll. Sushi is defined by the rice. If an ingredient is pressed on or rolled in the sushi rice – then you have sushi. Sushi rice is not complicated, but its preparation is important. I am not going to go into the recipe for making the rice or how to roll sushi. For that, I have found a few sites that already go into that detail. They are listed at the end of this post. I do want to stress the importance of the rice. I use a Japanese short grain rice, rinse it in cold water (warm or hot water will begin the cooking process) 3 – 5 times until the water is mostly clear. This step is important to remove the excess starch from the grains allowing the rice to become sticky when cooked. Sticky is good. Follow the directions on the rice bag for cooking the rice. When visiting relatives in Minnesota, we were not able to find the correct rice, so I improvised and used long grain white rice. We were able to make sushi using that rice, following the same steps as if it was sushi rice. When the rice is done, it will need to be cooled down. Most sites will recommend purchasing a wooden rice bowl. You can. That is one thing I don’t have. I use a 9×13 glass Pyrex pan (glass or wood based pans/bowls are important. Metal is not good as it will react to the vinegar). I spread out the rice. You can fan it using a hand-held fan, paper, etc.. OR don’t fan it. I typically don’t. Instead, I cut through the rice with the spatula and flip sections over every minute or two. While the rice is cooling, I make the vinegar mixture. I add the salt, sugar and rice vinegar to a glass bowl/measuring cup and heat on medium high for about 45 seconds. Remove and stir it to dissolve the sugar and salt. Then drizzle it over the rice and continue to stir the rice to be sure all rice has some of the vinegar mixture. It might seem a bit wet at first, but don’t worry; the rice will absorb it and go back to being sticky again with a nice shiny coat from the sugar. Continue stirring/flipping the rice every 1 -2 minutes until the rice has cooled enough to be handled. Now you are ready to make sushi. The links below will explain the process of assembling different types of sushi. I will now talk about all the fun you will have. My nephew recently visited from out-of-town. He just turned 14 and my son is just a couple of months behind him. Both my son and my nephew LOVE sushi, so I decided we would have a Sushi night. Not just any night, but one where THEY made it. I looked around the fridge and freezer for ingredients. As I said earlier, Sushi is a culinary gold mine, now I will explain why, but first throw out your idea of a standard California, Philly, Tuna, Salmon rolls. You can put anything you want into a roll. Don’t like the idea of seaweed, use slightly blanched greens (spinach, collard greens, lettuce, etc..) or very thinly sliced cucumbers, eggplant, zucchini, summer squash (sprinkle veggies with salt, let sit for 20 minutes, rinse – this will make it pliable), bread, soft taco shells, flat pasta, rice paper. Heck some even substitute the rice with soba noodles or mashed potatoes.. getting the idea? You can make a great dinner with what is already in your fridge, freezer and pantry. The only rule for the ingredients is in the prep work. For making rolls, items should be sliced in to long thin strips (Julienne) or a small dice. You will need to line the ingredients in a line about a ½ inch thick, any thicker you may not be able to roll it up without the ingredients spilling out and the roll falling apart. The thinner you can make it, the more combinations you can make for the filling. Another good thing sushi is economical to make at home. You can treat yourself to some high quality items, if you wish, as you don’t have to buy as much as you might think, a little goes a long way. Sushi is filling. Figure 2 rolls per person (12 pieces of sushi). If you using Tuna – you will need no more than a 1/2 inch thick, 1 in wide, 3 in long strip. It will be cut into 4 strips (2 strips per roll). That is about 1/5 of a typical tuna steak. Sushi makes a great appetizer and a great way for guests to have fun and get involved. They can pick the ingredients and even teach them to roll their own. I do that a lot when I go to Minnesota. My family/friends get together, I put out an assortment of ingredients, and they pick and choose what to put into the roll. Kids love it too. They can come up with some pretty interesting combinations. But they eat it because they created it. My son and his cousin proud themselves on the levels of heat they can tolerate. My son made the “Wasabi handshake roll” he made up last night. Let’s just say, tears were involved. But I can’t remember when I had so much fun making dinner. Buffalo Chicken Got boneless buffalo chicken wings in the freezer? Heat them up, slice them up, and then roll them up with some blue cheese dressing and strips of celery\carrots (you can use the shredded carrots found in grocery stores to save some time). Fruit Platter pineapple, apple, cantaloupe, melon, strawberries, kiwi, or any fruit you can think of. Perhaps you have a chocolate dip to go with it.. or a yogurt mint dip. So you get the idea. You can turn anything into Sushi. This is a great way to re-do left overs. Fried chicken – no problem. Roll it up, serve with some gravy on the side – voila. Fun. Left over pizza.. Why have re-heated pizza with a limp crust? Remove the toppings from the pizza, put on a cutting board, chop it up and use it as filling for the sushi with some warm sauce on the side and use lasagna noodles instead of nori. You can also roll the filling in puff pastry/crescent rolls and bake for a fresh pizza roll. Pasta? Meat loaf, meatballs, salad? Why not? Use your imagination and have fun. Don’t worry if it doesn’t come up perfect. It still tastes good and didn’t you laugh? I hope this inspires all to have fun with food this holiday season. Posted by culinaryease on December 22, 2010 in Cooking for two or less, General Cooking, Parties, Appetizers, and More, Recipes, Vegan/Vegetarian and tagged Japanese cuisine, Kids, Soy sauce, Sushi.